In the Easter Festival at Ilkley John Holland and Jackie Pye finished third in both the Mixed Pairs and the Swiss Pairs. 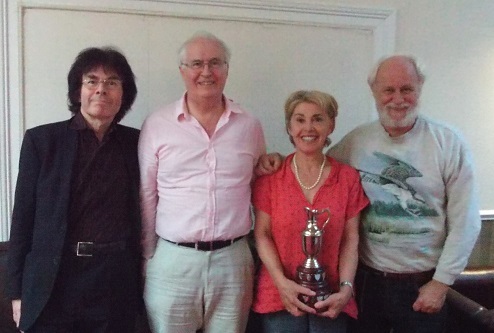 John and Jackie then teamed up with Alan Mould and Michael Newman to win the Swiss Teams on Sunday concluding a successful tournament. Tom Slater's team was second. Full results are on the EBU web site. This year's final will be between St Titus (Michael Byrne) and New Connections (Roger Hopton). New Connections did well to beat Jeff Morris in a close semi-final. The winning team will represent Manchester in the inter county Pachabo competition in June. Most divisions are now completed or near completion. Congratulations to those who won their divisions or are promoted. In division one Michael Byrne's St Titus team have won, winning all their matches. Kath Nelson's Agamemnon are second. In division two the final match between Proteus (Frank Brown) and Manchester S (Kevin Comrie) will decide who is promoted alongside Eve Lighthill's DASH. DASH are promoted despite winning four and losing five matches. In division three Petersfield (Eddie Thornton-Chan) have won with Alan Tranter's Hindsight Convention second. In division four Astrazeneca Stars (David Milne) have won just ahead of Chorlton Challengers (Bev Pardoe). Ray Hill's Monton Misfits won division five unbeaten, Adam Wiseberg's lastminute.bid won their last match well to finish second. 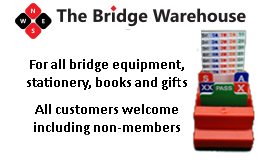 In division six 4 Bridgemates (Margaret Harris) need a handful of VPs in their final match against the bottom team to ensure promotion. John Berry's Double Trouble are currently second and will be promoted. In division seven there is an intriguing situation, the final match between Ruff Diamonds (Peter Shakespeare) and Ashton United (Sheila Wimbleton) will decide who is promoted along with Larkhill-1, unless it is a 15-15 draw in which case there will be a triple tie between those two teams and Larkhill-1 (Estelle Megitt). We are sorry to report that Michael Clarke died on 17th April of pancreatic cancer. Michael was a long standing member of the MCBA. He was primarily a rubber bridge player but had been a member of Kath Nelson's Agamemnon league team for many years, playing with Martin Braid until Martin's death a few years ago and then with Jeff Morris. The team always placed well in the league, winning in 2007 and finishing second this year. Michael was also on the Goldstone Trophy winning team in 2007 and won the Gazette Trophy a couple of times on Manchester Bridge Club teams. He represented England in the winning Junior Camrose team in 1981 partnering Jeremy Wyndham with whom he won National Masters Pairs in 1982. Our condolences to his wife and family. Nearly half the field were Manchester players at Preston on 14th April. Best Manchester result was achieved by John Holland with Jackie Pye who were second. Jeff Morris and John Hassett were third. Results are on the Preston site. Catherine Draper played for England in the women's home internationals in Ireland on the weekend of April 12th-14th with Susanna Gross, Sally Brock, Gilly Cardiff, Nicola Smith and Yvonne Wiseman. England won the competition with Catherine and Susanna heading the Butler rankings. The event web site is here. John Holland played for England Seniors on the weekend of April 5th-7th in the home internationals in Edinburgh. The rest of the team was Norman Selway, Paul Hackett, Gunnar Halberg and David Mossop. England won by a large margin, with John and Norman second in the Butler rankings. The event website is here. 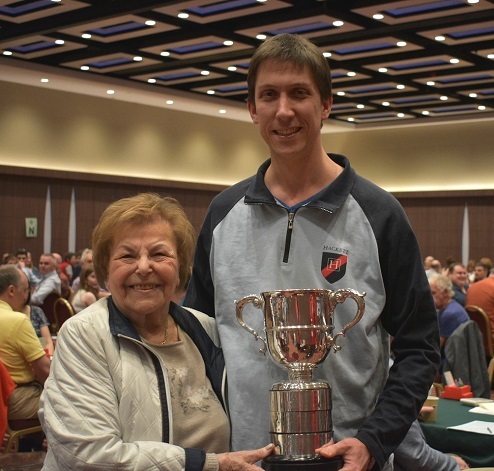 Congratulations to Michael Byrne who won the EBU's Mixed Pairs event playing with Dinah Caplan of London at Richmond on 24th March. They were lying second just behind Bernard and Rhona Goldenfield after the first session and a solid second session saw them just stay ahead of another pair playing at Richmond who managed a 72% second session. At 86 years old Dinah becomes the oldest ever winner of the Portland Pairs. Bernard and Rhona finished 13th, with John Holland and Jackie Pye 14th. Full results are on the EBU web site. Thanks to Michael Byrne for many reports. League page maintained by Kath Nelson, Cup page by Adam Wiseberg. Counter http://www.digits.net - visitors since Jan 2000. Copyright Rodney Lighton 1999-2019.